What is used to protect a Mars or possibly interstellar spacecraft against meteoroids and asteroids? How risky it it to travel through space and does higher speeds equal more risk? Would a long wedge shaped ship like a long needle with enough of a shallow angle that the object would just be moved to the side with no damage? Interstellar travel typically involves much higher velocities than current probes achieve. Depending on how long you are willing to allow the mission to take, you need velocities of a decent fraction of the speed of light. At that speed, anything you collide with, even the smallest speck of dust is quite dangerous. For instance at $0.1c$ (40 years to the nearest star) a $1 mg$ spec of dust carries about $500 MJ$ of relative kinetic energy, equivalent to the explosion of about 120 kg of TNT. Shape of the spaceship doesn't matter. Even a glancing collision will do huge damage. Even a single hydrogen atom behaves like incoming radiation, with a kinetic energy of $7 MeV/c^2$ similar to the neutrons released by a fusion reaction. We're in the realm of speculation, or even science fiction, as we consider how to shield against this, but most likely you need a shield that can go in front of the spaceship and take the damage. This could be a thick layer of armour, maybe made from ice, or a cloud of electrically charged dust or gas held in place by magnetic fields. If you can make sure anything you might hit is electrically charged (perhaps using electron beams or UV lasers), you could use magnetic fields to divert it. One should consider vectors of the items in question and allow that shape of the ship will have little impact on an impact. A good comparison is a vehicle traveling on a roadway. As it approaches an intersection with a green light, traveling at high speed, another vehicle disregards its red light and collides with the first vehicle. The shape of the first vehicle is inconsequential, as the impact is at 90° to the direction of travel of the first vehicle. Avoidance is the primary method for today's spacecraft to avoid collisions, at least until energy shields are created. This is more a sci-fi response, however. Current spacecraft outside Earth orbit have little or no protection. their structure is not built to withstand impacts from anything larger than a speck of dust at 10 km/s. There are a few exceptions. Comet missions like Giotto and Stardust have a Whipple shield, because the environment around a comet is dense enough to guarantee hits. For risky operations (flying through an area where debris is known to exist) spacecraft are sometimes commanded to fly in the 'antenna to ram' direction. This means the dish antenna faces forward, and the dish can act as a Whipple shield. Cassini used this on occasion, for example. This was one of the contingency plans for New Horizons' encounter with Pluto (there was a suspicion Pluto might have rings). See also this question on the preparations for New Horizons' flyby of Pluto. There were concerns that there might be a lot of debris in Pluto's orbit. planets with moons can have lots of debris (meteoroid impact on the moon, debris of the impact reaches escape velocity and orbits for a while). The ultimate case of this is a ring system. This means that at the usual speeds reached by interplanetary probes (10-100 km/s) a grain of sand will go right through a plate of aluminium. You can protect against small debris (up to a few mm in diameter) using a Whipple shield, but you can forget about protecting against larger debris. A wedge shape provides more protection. This principle is used in armored vehicles. The problem is that the energies involved are so high, you'd need a very shallow angle, which creates a very long, heavy cone. Interplanetary probes don't have the weight budget to accommodate that. From what I understand and correct me if I am wrong. Radar today cannot detect small particles/meteors in space out far enough to make adjustments at speeds needed for interstellar travel currently. To conclude the least time spent in space after a certain speed decreases the risk of collision. The faster the ship travels the narrower the collision window. Avoidance would still currently be the best option. Although we cannot scan the flight path ahead to make coarse adjustments, probes could travel ahead of ship and laser relay back to the mother ship coarse corrections do to debris that may trigger the net between them. Not the answer you're looking for? Browse other questions tagged design interstellar-travel shielding meteoroid or ask your own question. Why doesn't the New Horizons probe fly any nearer than 10,000 km from Pluto? What limits the speed of space probes currently? 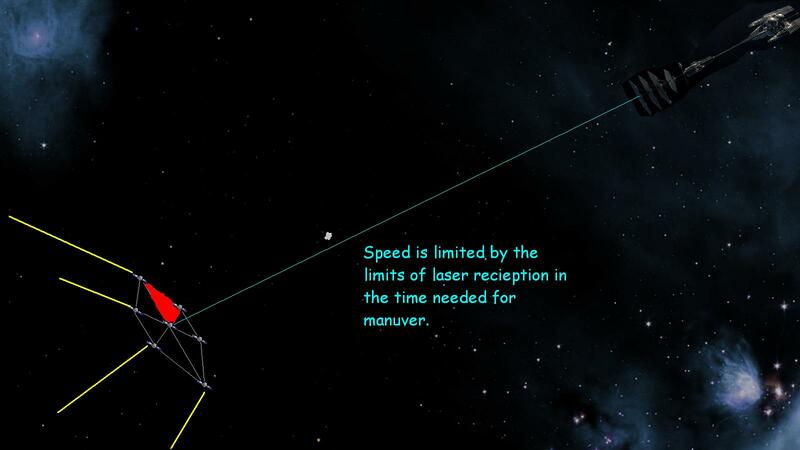 How could the laser from Earth to a spacecraft be used other than to propel its light sail? How much material AND energy are needed to protect a spacecraft from radiation as well as the Earth does? Are artificial magnetic fields used or proposed to be used to shield astronauts from charged, high energy radiation? How does a space probe differ from a satellite in terms of materials used and size? What type of software is used to make radiation shielding simulations for use in Space or Mars? What are some notable computer systems used in space probes?